Do you have too much month at the end of your money? Is your credit card screaming for relief? Are you tired of robbing Peter to pay Paul . . . whoever they are?Meet Steve and Annette Economides. They’ve been called cheapskates, thriftaholics, and tightwads, but in these tough economic times, Steve and Annette have managed to feed their family of seven on just $350 per month, pay off their first house in nine years and purchase a second, larger home, buy cars with cash, take wonderful vacations, and put money in savings. Without degrees in finance or six-figure salaries, Steve and Annette have created a comfortable, debt-free life for themselves and their children. 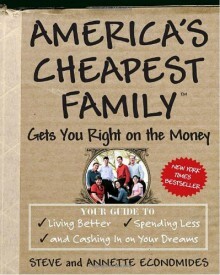 In America’s Cheapest Family Gets You Right on the Money, they show you how they did it- and how you can do it too.Steve and Annette share many down-to-earth principles and the simple spending plan that they have used since 1982. They have taught this economizing lifestyle to thousands of people worldwide through seminars and their newsletter, and they include lots of real-life stories to make you feel as if you’re having your own private coaching session. Not only will you find solutions to your financial dilemmas, you’ll also discover a whole new way of life. You don’t need to be a CPA or a math wizard to learn their revolutionary system, which will teach you:- hundreds of ways to save money on everyday household expenses, including groceries, clothing, and health care- how to save in advance for major purchases such as homes, cars, and vacations- how to stop living paycheck to paycheck- how to eliminate debt . . . forever! America’s Cheapest Family Gets You Right on the Money puts meeting your financial goals- and living well at the same time- in reach for every family. Good tips on being frugal.